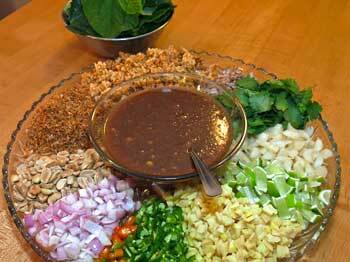 Miang kam is a tasty snack often sold as street food. 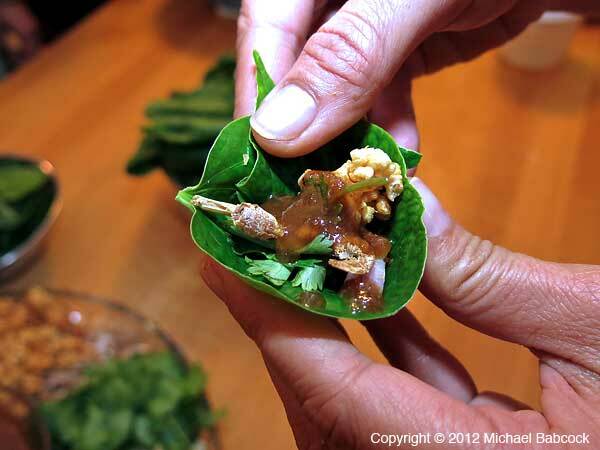 It involves wrapping little tidbits of several items in a leaf, along with a sweet-and-salty sauce. Chewing all the myriad ingredients together gives taste receptacles on the tongue and mouth a thrilling experience – from the rich, roasted flavors of coconut and peanut, to the tanginess of lime with zest and the pungent bursts of diced ginger and chillies. It makes a great party food. To roast coconut, place unsweetened fresh or dried shredded coconut in a dry cast iron pan over medium heat. Stir frequently until the coconut shreds are evenly a golden brown and very fragrant. Pickled garlic is available in jars from Southeast Asian markets. Arrange the spinach or lettuce leaves and filling ingredients on a large serving platter, piling each separately and aesthetically for a pleasing presentation. To make the sauce, grind the dried shrimp, roasted coconut and peanuts separately and as finely as possible in a clean coffee grinder. (For the dried shrimp, measure out 1/4 cup after the shrimp is ground.) 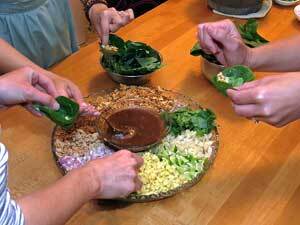 Place in a small saucepan together with the palm sugar, fish sauce and water. Bring to a boil, lower heat and simmer, stirring frequently to make sure all the ingredients are well blended and the sauce as smooth as possible. Cook about 10-15 minutes, or until the mixture has thickened to the consistency of light batter. Transfer to a sauce bowl and allow to cool to room temperature before using. The sauce will thicken more as it cools. To eat, take a spinach or lettuce leaf, fill it with a little bit of everything, top with a dab of sauce, roll or wrap up, stuff the entire leaf packet into your mouth and chew everything all at once. Enjoy the explosion of flavors! Miang Kam is often sold as a street food in Thailand in an interesting form. 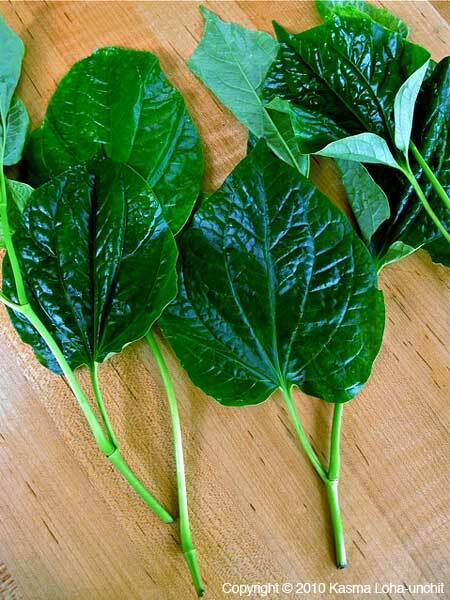 The vendor places four or five ingredients in the leaf, a dollop of sauce, and then wraps up the bundle and skewers it onto a stick – Miang Kam on a Stick! Kasma teaches this recipe in the Evening Series Intermediate #3. See Also: Anita Crotty's Miang Kam Pictures (opens in new window), based on Kasma's recipe from Intermediate Class Day 3. Recipe Copyright © 2000 Kasma Loha-unchit. All rights reserved.